Make sure you do the prep work before you put your home on the market! Are you planning on selling your home someday? Many homeowners make the mistake of putting their house on the market without doing any preparation. If you want to receive top-dollar for your home, there are all sorts of prep work that needs to be done! With that said, here are four important home staging tips! A cluttered home will drive away potential buyers. If your home is littered with junk, you need to find a way to get rid of it before you began listing your home for sale. Not only is clutter unattractive, but it will make a home look and feel less spacious. Do yourself a favor and either rent a storage locker, take some trips to the local landfill, or host a yard sale. It doesn’t matter what you do, just get the clutter out of your home! Believe it or not, your front door makes a huge impression on the rest of your home. If your front door is ugly and uninviting, that will give a homebuyer that is touring your home a bad first impression. Maybe it could use a fresh coat of paint. 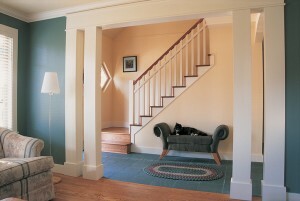 Maybe you could change up the color for something more inviting that offers a nice contrast to the color of your home. Color can do wonders for your home. They can bring life and provide an entirely different dimension to a room. As much as you love your beautifully painted lime green bathroom, you are probably better off repainting it a neutral color. This is because this is what most home buyers are looking for in their new home.